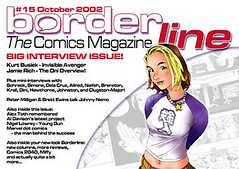 Borderline was one of the most innovative comics magazines of its kind. 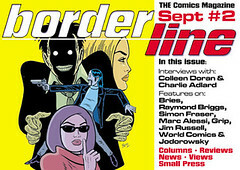 Created by former Comics International news and features editor, Phil Hall, Borderline was the world's first PDF comics magazine available to read on a computer or as a print out. Launched as a free download, in August 2001, the magazine lasted 20 issues, plus two specials and won the prestigious Best Comics Magazine award at the 2002 National Comics Awards in the United Kingdom. 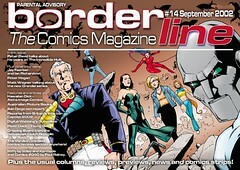 Borderline has been described as a cross between The Comics Journal and the NME with a heady mix of mainstream American and world comicbooks. Comics from countries such as Brazil, Poland and the Philippines were featured alongside comicbook icons. Borderline had one of the most tumultuous rides in recent comicbook history. 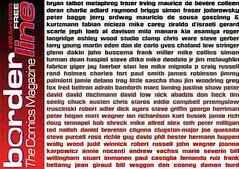 With over 150,000 people reading the magazine by issue #3, the magazine became the 'in-place' to be seen and subsequently the magazine had exclusive interviews with people who didn't normally do interviews. However, after a series of unfortunate events and unforeseen controversies, the magazine folded in the March of 2003. There was a special in the following summer, and that was to be followed by a new volume of issues, but to this day that has never appeared. 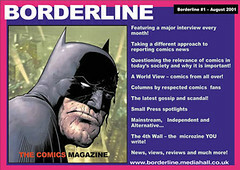 Borderline: The Comics Magazine was regarded by many as a definitive example of the 'all-encompassing' comics magazine, but critically, while it was immensely popular as a free download, when, through economic necessity, the magazine started to charge, an average of 100 people paid - there was just too much free web content available. Ironically, the majority of the people who did pay for the magazine came from either South America or Europe, with less than 10% from the UK or USA. The principal contributors to the magazine were: Phil Hall, Martin Shipp, Mike Kidson, Andrew Cheverton, Jay Eales and Danny Black. Others involved in the magazine included: Mike Conroy, Peter Ashton of Bugpowder, Paul Gravett, Ian Richardson, Frazer Irving, Selina Lock, Terry Wiley, Christopher Spicer, Paul Rainey and many others, who have gone onto secure freelance work through exposure given in Borderline.